In Asturias, when autumn arrives, not only leaves fall. By numerous county roads and by infinity of local roads and badly traced paths, an armored fruit which hedgehog, loaded with defensive spines, sleeps peacefully on the ground as it continues to mature and opens in two. Their barbs are more dejected, relaxed. From the green it passes to the brown and in its entrails the rich chestnut waits, the one that comforts our body in the coldest months of the year. Nourishing and tasty, the size of the walnut, the chestnut, without the thorny mantle, it is still shy and introspective, and it is still protected with a leathery, dark brown skin that, when dried in smoke, is called "pilonga" . In this state it can be stored all year long. The parragian capital, Arriondas, for a long time now, it has turned the chestnut into an object of gastronomic cult, taking it out of its ostracism and the twists and turns. 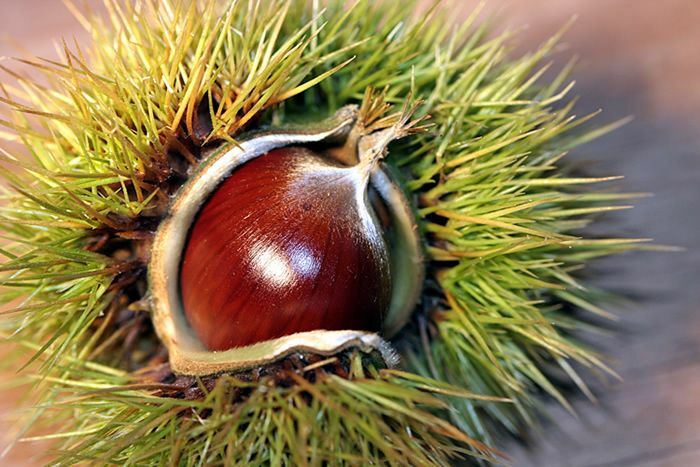 Every year, in mid-November, the popular organizes Chestnut Festival. The "castañazu", as some know it in relation to the nocturnal atmosphere of that festive weekend, gathers many fans during the day for more than 25 years. A few tons of tasty chestnuts are sold at this event. 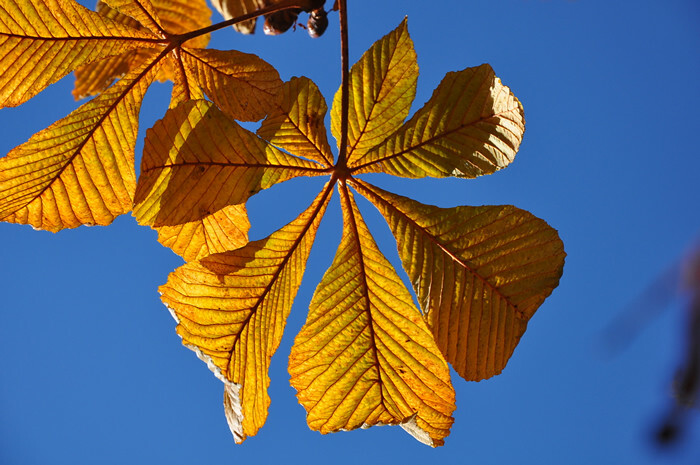 It is one of the few commercial versions of a ritual: that of the collection of chestnut, which has hardly pursued other potential markets than those of home consumption. In reality, in the region there are no producers, but gatherers. The latter abound everywhere, anyone can be. All the fan of this fruit knows where to go to look for it in season. Go to the gueta is to go "to fix" chestnuts of the ground by the ways or caleyas, or the castañeos next to the walled estates. The rite of the chestnut begins in a common place, it belongs to everyone, and ends in a common way also, in public and popular consumption. 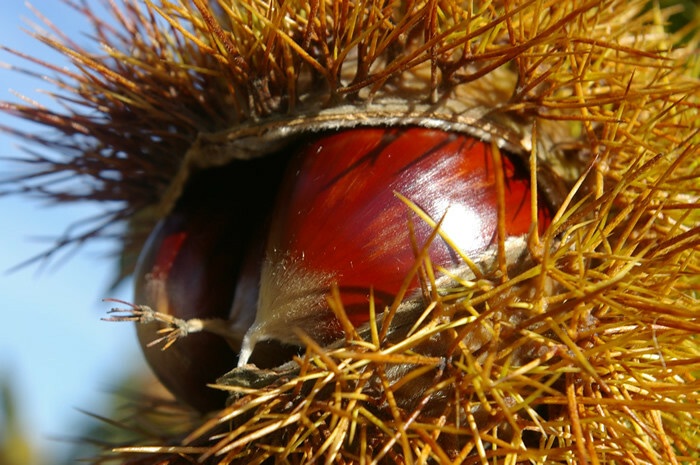 There are initiatives, almost experimental, that try to focus the cultivation of chestnut to a future economy, based on the profitable marketing of chestnuts. This is the case in the center of La Toya, in Parres itself, where it is a question, first of all, of studying the prolific diseases that affect the chestnut tree and its subsequent harvest. The market to which we aspire begins caring and knowing the tree, overcoming the common epidemics that are taking hold of him, just as he began decades ago to take over the apple tree. 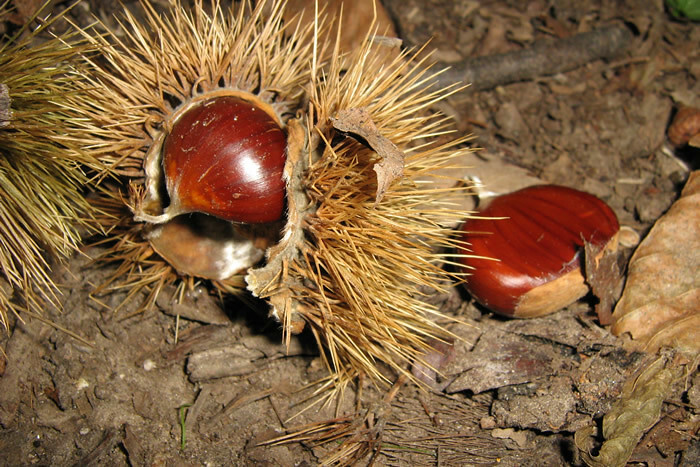 Be as it was, and waiting for the phytosanitary aspects to consolidate and the economy take the baton, the chestnut has been and continues to be a preferential apology for social acts or rituals of the Asturian autumn. The famous amagüestos they have been celebrated in all Asturian villages and villages since time immemorial. 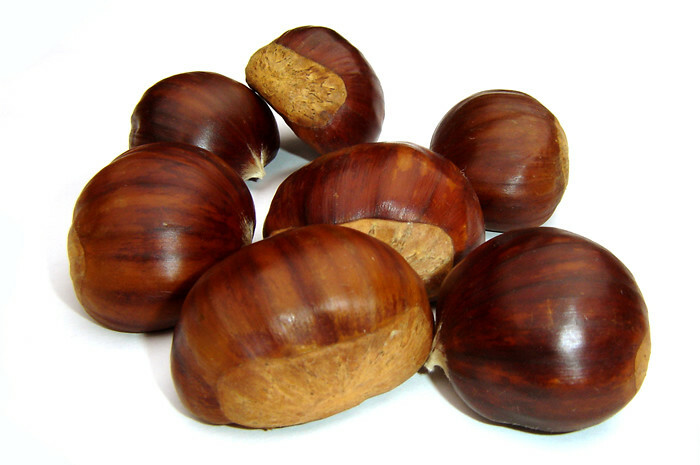 The chestnut came with the Romans to Asturias, and for a long time, before the arrival of the American potato, it was the main calorific nutrient in the winter. Something so important in the past diet can not go unnoticed in modern times no matter how varied the diet. Around the chestnut celebrate verbenas, some mass and tambourines, bagpipes and regional costumes. A tribute that comes from the soul to the Asturians. Traditionally the chestnuts were heated on an iron, before serving the purpose of the traditional kitchen plates, which also used to consume logs from the chestnut tree itself. The amagüestos at home are accompanied with cider, usually sweet. This castañeda tradition has left a mark, in addition to Parres, in other numerous towns and Asturian municipalities as Candamo, Navelgas, LlanesEtc., etc. The essence of this hobby is to look for it at the very core of the fruit, its intrinsic qualities. Qualities that are numerous and good for the organism: high carbohydrate content (40%), low fat (2-3%), high protein quality (5-10%), and no cholesterol. All associations and organizations interested in public health recommend it in the diet. The Spanish chestnut, and with it the Asturian, is one of the most appreciated in the world for its flavor. Although entire continents, such as Australia, have long specialized in their commercialization, it can be said that they have done so by making them less tasty, using somewhat artificial conservation techniques that are far removed from the pilonga trick, cited here. The gastronomy associated with chestnut it also surpasses the almost rudimentary simplicity of the amagüestos and turns it into a queen of exquisite dishes that bear her name. Chestnut soup, for example, where they are mixed with chicken broth, celery, salt and pepper, lemon ... macaroni with chestnuts. As a sweet dessert: chestnut compote. Be it in pure state or in sophisticated dishes, the chestnut hoards a high nutritional value and a social value that in regions like Asturias serve to perpetuate friendship and neighborhood ties with satisfied stomachs. 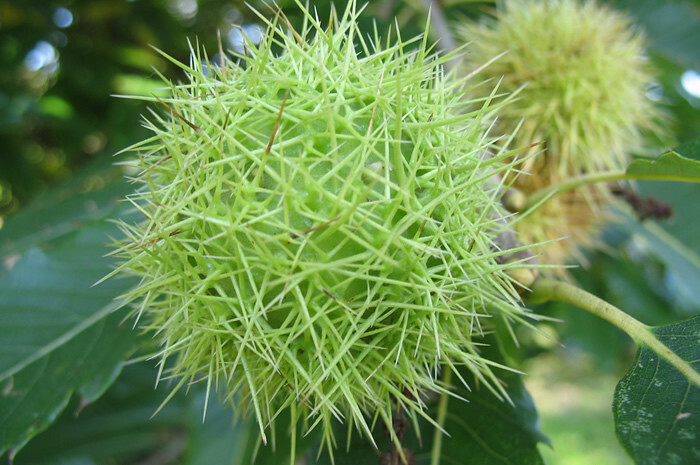 An answer to "The chestnut diet"